If you are looking for elegant and affordable home furnishings in Fresno, CA, there’s no better place than International Furniture. Our home furnishings store is dedicated to providing furniture selections that are just as stylish as they are affordable. You will love our amazing array of furniture from trusted brand names such as Ashley, Sierra Sleep, Benchcraft, and more. In terms of our selection, you can count on us to carry furniture in a wide variety of different colors and styles. From contemporary furniture to traditional furniture — we have enough options to fulfill all your home furnishing needs. We have furniture for your living room, dining room, and even your home office. We have bedroom furniture selections for children and adults, along with a large collection of mattresses. We also have unique home accents that can add an extra touch of beauty to any room’s décor. On top of our great home furnishing options, we also provide friendly customer service, whether you shop with us online or in our Fresno, CA furniture store. All our staff members are knowledgeable about the products that we offer and they can answer any furniture-related questions you may have along the way. We not only want our customers to be happy with their purchase, but we want them to be knowledgeable about the furniture they select as well. 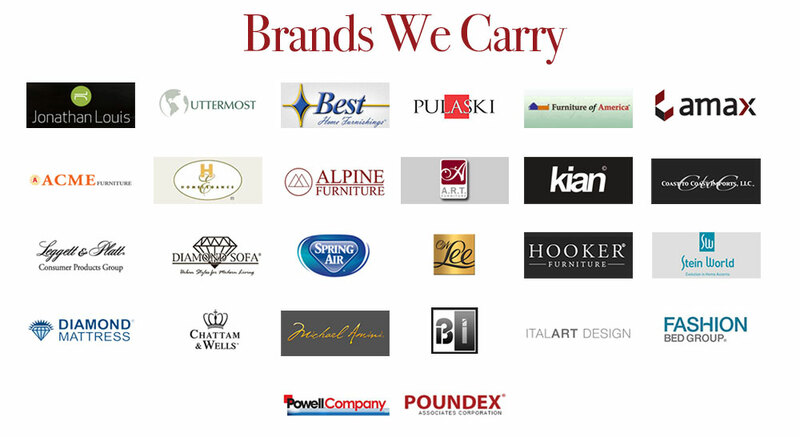 We encourage you to visit us at International Furniture today. Our discounted furniture shop is open 7 days a week and is located at 715 E. Olive Avenue. We look forward to working with you!